True Nature Holding, Inc., a Delaware corporation (the “Company”) has issued the following Convertible Promissory Notes to provide short term bridge financing to the Company (the “Bridge Notes”). All Bridge Notes currently being used by the Company include provisions that prohibit any portion of the Bridge Notes from being converted into common stock of the Company (the “Common Stock”) for a period of 180 days. The Company believes it will prepay in full the outstanding amounts due under the Bridge Notes prior to the exercise of any convertible features included in the Bridge Notes (the “Prepayment”). However, the Company can provide no assurances it will be able to obtain the financing necessary for the Prepayment. On November 9, 2018 (“November Issuance Date 1”), the Company entered into a Securities Purchase Agreement (the “Power SPA”) with Power Up Lending Group Ltd., a Virginia corporation (“Power”), to which Power agreed to purchase a Convertible Promissory Note (the “Power Note”) in the aggregate principal amount of $33,000.00 (the “Power Loan”). On or about November 10, 2018, the Company received approximately $30,000.00 in net proceeds in exchange for the sale of the Power Note to Power. The Power Note entitles Power to 12% interest per annum and matures on August 30, 2019. In the event the Company prepays the Power Note beginning on November Issuance Date 1 through the 180th day following November Issuance Date 1, the Company must pay Power all of the outstanding principal and interest due plus a cash redemption premium ranging from 115% to 140%. After the 180th day following November Issuance Date 1, there is no further right of prepayment by the Company. Power has no right of conversion under the Power Note for a period of 180 days commencing on November Issuance Date 1. In the event the Company has not paid the Power Loan in full prior to 180 days from November Issuance Date 1, Power may convert all or a portion of the outstanding principal of the Power Note into shares of Common Stock at a price per share equal to 61% of the average of the lowest two closing prices of the Common Stock during the 20 trading day period ending on the last complete trading day prior to the date of conversion. Power may not convert the Power Note to the extent that such conversion would result in beneficial ownership by Power and its affiliates of more than 4.99% of the issued and outstanding Common Stock. On November 26, 2018 (the “November Issuance Date 2”), the Company entered into a Securities Purchase Agreement (“SPA 1”) with Auctus Fund LLC, a Massachusetts limited liability company (“Auctus”), to which Auctus agreed to purchase a Convertible Promissory Note (“Note 1”) in the aggregate principal amount of $125,000.00 (the “Auctus Loan”). On or about November 28, 2018, the Company received $111,500.00 in net proceeds in exchange for the sale of Note 1 to Auctus. Note 1 entitles Auctus to 12% interest per annum and matures on August 26, 2019. In the event the Company prepays the Note 1 beginning on the November Issuance Date 2 through the 180th day following the November Issuance Date 2, the Company must pay Auctus all of the outstanding principal and interest due plus a cash redemption premium ranging from 135% to 150%. After the 180th day following the November Issuance Date 2, there is no further right of prepayment by the Company. Auctus has no right of conversion under Note 1 for a period of 180 days commencing on the November Issuance Date 2. In the event the Company has not paid the Auctus Loan in full prior to 180 days from the November Issuance Date 2, Auctus may convert all or a portion of the outstanding principal of Note 1 into shares of Common Stock at a price per share equal to 55% of the lowest closing price of the Common Stock during the 25 trading day period ending on the last complete trading day prior to the date of conversion. Auctus may not convert Note 1 to the extent that such conversion would result in beneficial ownership by Auctus and its affiliates of more than 4.99% of the issued and outstanding Common Stock. In connection with the issuance of Note 1, the Company issued Auctus a common stock purchase warrant to purchase up to 625,000 shares of Common Stock at an exercise price of $0.10 per share, subject to adjustment, expiring five years from the November Issuance Date 2 (“Warrant 1”). On December 19, 2018 (the “December Issuance Date”), the Company entered into a Securities Purchase Agreement (“SPA 2”) with Crown Bridge Partners LLC, a New York limited liability company (“Crown”), to which Crown agreed to purchase a Convertible Promissory Note (“Note 2”) in the aggregate principal amount of $40,000.00 (“Crown Loan”). On or about December 20, 2018, the Company received $36,000 in net proceeds for the sale of Note 2 to Crown. Note 2 entitles Crown to 12% interest per annum and matures on September 19, 2019. In the event the Company prepays Note 2 beginning on the December Issuance Date through the 180th day following the December Issuance Date, the Company must pay all of the principal and interest plus a cash redemption premium ranging from 135% to 150%. After the 180th day following the issuance of Note 2, there shall be no further right of prepayment by the Company. Crown has no right of conversion under Note 2 for a period of 180 days commencing on the December Issuance Date. In the event the Company has not paid the Crown Loan in full prior to 180 days from the December Issuance Date, Crown may convert all or a portion of the outstanding principal of Note 2 into shares of Common Stock at a price per share equal to 55% of the lowest closing price of the Common Stock during the 25 trading day period ending on the last complete trading day prior to the date of conversion. Crown may not convert Note 2 to the extent that such conversion would result in beneficial ownership by Crown and its affiliates of more than 4.99% of the issued and outstanding Common Stock. In connection with the issuance of the Note, the Company issued Crown a common stock purchase warrant to purchase up to 400,000 shares of Common Stock at an exercise price of $0.10 per share expiring five years from the December Issuance Date (“Warrant 2”). On January 2, 2019 (the “January Issuance Date”), the Company entered into a Securities Purchase Agreement (“SPA 5”) with Power Up, to which Power Up agreed to purchase a Convertible Promissory Note (“Note 5”) in the aggregate principal amount of $53,000.00 (“Power Loan 5”). On or about January 3, 2019, the Company received $50,000.00 in net proceeds for the sale of Note 5 to Power Up. Note 5 entitles Power Up to 12% interest per annum and matures on October 30, 2019. In the event the Company prepays Note 5 beginning on the January Issuance Date through the 180th day following the January Issuance Date, the Company must pay all of the outstanding principal and interest due plus a cash redemption premium ranging from 115% to 140%. After the 180th day following the January Issuance Date, there is no further right of prepayment by the Company. Power Up has no right of conversion under Note 5 for a period of 180 days commencing on the January Issuance Date. In the event the Company has not paid Loan 5 in full prior to 180 days from the January Issuance Date, Power Up may convert all or a portion of the outstanding principal and interest of the Note into shares of Common Stock at a price per share equal to 61% of the lowest closing bid price of the Common Stock during the 20 trading day period ending on the last complete trading day prior to the date of conversion. Power Up may not convert Note 5 to the extent that such conversion would result in beneficial ownership by Power Up and its affiliates of more than 4.99% of the issued and outstanding Common Stock. The Notes contain certain representations, warranties, covenants and events of default. If an event of default occurs, the amount of the principal and interest due under each of the Notes increases and can be considered immediately due and payable. On December 7, 2018 the Company fully paid and satisfied that certain Convertible Promissory Note issued July 5, 2018 in favor of Power Up in the principal amount of $38,000.00 (the “July Power Note”). Payment in the amount of $56,365.76 was delivered to Power Up in cash, and no shares of Common Stock were issued in connection with the pay-off of the July Power Note. The foregoing description of the terms of the Power Note, Note 1, Note 2, Note 5, Power SPA, SPA 1, SPA 2, SPA 5, Warrant 1, and Warrant 2, do not purport to be complete and are qualified in the entirety by the complete text of the documents attached as, respectively, Exhibits 4.1, 4.2, 4.3, 4.4, 10.1, 10.2, 10.3, 10.4, 10.5, and 10.6 to this Current Report on Form 8-K.
Reference is made to the disclosure set forth under Item 1.01 of this Current Report on Form 8-K, which disclosure is incorporated herein by reference. Power Note, Note 1, Note 2, Note 5, Warrant 1 and Warrant 2 (the “Securities”) were offered and sold in reliance upon exemptions from registration to Section 4(a)(2) of the Securities Act of 1933, as amended (the “Securities Act”) and Rule 506 of Regulation D promulgated thereunder (“Regulation D”). The Company made this determination based on the representations of the holder of such securities (the “Purchaser”) which included, in pertinent part, that the Purchaser was an “accredited investor” within the meaning of Rule 501 of Regulation D and upon such further representations from the Purchaser that (i) the Purchaser is acquiring the securities for its own account for investment and not for the account of any other person and not with a view to or for distribution, assignment or resale in connection with any distribution within the meaning of the Securities Act, (ii) the Purchaser agrees not to sell or otherwise transfer the Securities unless they are registered under the Securities Act and any applicable state securities laws, or an exemption or exemptions from such registration are available, (iii) the Purchaser has knowledge and experience in financial and business matters such that it is capable of evaluating the merits and risks of an investment in the Securities and (iv) the Purchaser is able to bear the economic risk of an investment in the Securities and could afford the complete loss of such investment. In addition, there was no general solicitation or advertising for the Securities issued in reliance upon Regulation D.
On December 31, 2018 the Company issued 25,000 shares of restricted common stock to a Board Member in consideration for consulting services. The Company values these shares at $0.10 per shares for a total charge to earnings of $25,000. 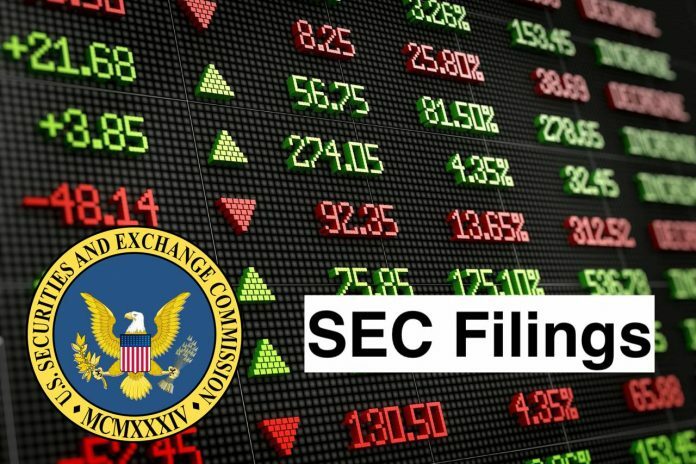 On December 31, 2018 the Company issued 85,000 shares of restricted common stock to an Officer in consideration for conversion of salary earned. The Company values these shares at $0.10 per shares for a total charge to earnings of $8,500. On January 4, 2019, the Board of Directors of the Company authorized, ratified and approved the appointment of Mr. Mark Williams as Chief Executive Officer of the Company, effective November 27, 2018. On December 7, 2018, the Company issued a press release announcing the appointment of Mark Williams, as Chief Revenue Officer and Member of the Board of Directors.